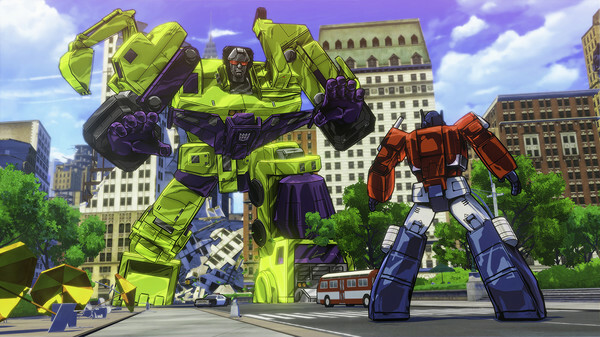 Transformers Devastation is a love letter to the original TV series and animated Transformers movie – and we review the PS4 version of the Activision game. If you’re a gamer and you watched the original series of Transformers cartoons when they first appeared on TV, odds are that you’re between 35 and 45 years old. Perhaps you played a Transformers game on the Commodore 64 back in the day, but a lot has definitely changed when it comes to the Transformers franchise. There have been several new iterations of the TV series and some spin-offs, and of course there are four Michael Bay movies now. Despite all that, fans of the original series still remain nostalgic about the first batch of episodes in the early to mid-eighties, and it’s those fans that Transformers: Devastation was made for. 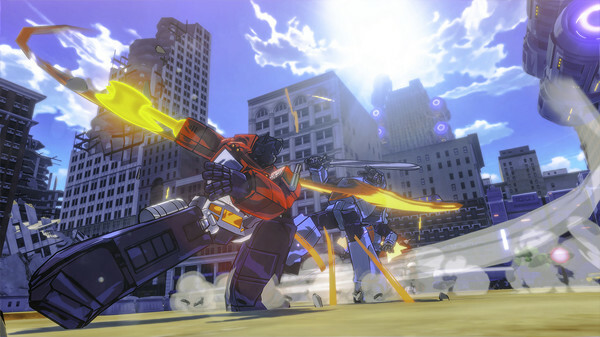 Not too drastically different from the recent “Cybertron” games, Transformers Devastation relies on hard-hitting robot combat – something that’s masterfully executed here. You can dodge and parry Decepticon attacks, counter them, or you can go on the offensive and blend together a flurry of moves. This includes transforming from your car form to your robot form (you can only play as Autobots in this game) or vice versa, plowing into an opponent as a truck and following it up with a barrage of punches. The star attraction here, however, is in the game’s audiovisual presentation. For the first time in a long, long while – this is a game that’s based off of the original TV series. With today’s technology, that means something special as well. For the first time ever we can play a Transformers game with cell-shaded characters that actually look like their cartoon originals. Optimus Prime and Bumblebee received major makeovers for the recent movies, but are back to their old selves here. That’s not just true for the look and feel of your Autobots, it also translates to the voice overs that were used. They don’t just sound like the original voices, they ARE the original voices. With people like Frank Welker (Megatron), Peter Cullen (Optimus Prime) and Dan Gilvezan (Bumblebee) all on board, this truly is a treat for the fans – especially those who were upset with all the changes that the series has gone through over the past 25 years. When it comes to delivering an authentic Transformers experience, this is without a doubt the best game you can possibly get. It’s too bad the same cannot be said about the gameplay experience itself. While very satisfying in-combat, the game feels like it could (and perhaps should) have been fleshed out a little more. There is a major emphasis on combat, and very little in-gameplay story development. There is some character development, but mostly in the shape of combat upgrades. With the audiovisual aspect being so good and the combat mechanics being solid and good fun, it feels like a wasted opportunity that we’re not being treated to a more dramatic storyline and gameplay where there’s more going on in between the different combat scenarios. There’s a story here, but it feels like you’re being told the story in between battles, rather than experiencing it yourself. So what we’re left with is a good game that’s wonderful to play for fans of the original Transformers, but also a promise. If the developers can get the same group of people together again for a grander follow-up, then we’re in for a truly classic Transformers experience. It’s too bad this isn’t it, but we’re sure glad this game was made.